(2002 'Telarc') (52:10/11) Endlich mal wieder eine 'Telarc'-Production, die rundum Spass macht! Eine gute Idee, diese beiden Gitarristen zusammen zu bringen. So unterschiedlich sie sind - Benoit mit seinen teils schwerfälligen Louisiana-Harmonien, und Thackery mit seinem gradlinigen Ostküsten-Bluesrock - so gut ergänzen sie sich hier. Ein spannendes Album, und das nicht nur, weil's jede Menge Gitarren zu hören gibt. Charlie Musselwhite kommt bei drei Stücken hinzu. Und dann hat's da noch die alte Stevie-Ray-Vaughan Rhythm-Section einschließlich Pianist Reese Wynans. Äußerst empfehlenswert / a great record, from the start to the finish. The idea of bringing east coast blues/rock guitar legend Thackery, and Louisiana swamp player Benoit together, may appear a strange one. But it works, it works real well. The rather laid-back style of Benoit fits perfectly to the tougher style that Thackery plays. Then you'll get Charlie Musselwhite on three cuts, and Reese Wynans on piano. The ryhthm backbone is delivered by SRV's rahythm section. A great record, especially if you are digging great blues guitar playing. JIMMY THACKERY - gtr/voc, TAB BENOIT - gtr/voc, CHARLIE MUSSELWHITE - hca, REESE WYNANS - piano, TOMMY SHANNON - bass, CHRIS LAYTON - drums. "THACKERY, Jimmy & TAB BENOIT"
Jimmy Tackery, born May 19, 1953, in Pittsburgh, Pennsylvania,and raised in Washington, D.C., has learned his skills first hand from the old blues masters. "Muddy was one of those guys who was constantly encouraging. He never told you what to do, but he always told you what you were doing wrong. He never minced words about that. The first time on stage with Muddy, I was in such awe of him that I just kept my eyes and ears open and just picked up on everything he did. It was the dynamics they had that became so ingrained in us. We heard it on the records and then stood on stage and saw how it worked." Along with Mark Wenner he founded The Nighhawks in the early 1970s working with the East coast quartet for the next 15 years, doing more than 300 shows a year. The Nighthawks had a loyal fanbase who enjoyed their special blend of Muddy Waters style Chicago blues and Sun Records-fueled Memphis style rockabilly and rock ’n’ roll. Tired of being on the road all year round, Thackery left The Nighthawks in 1987 leaving behind a legacy of great albums. He wanted the opportunity to write and put newer material into the sets. First he formed a six piece R&B band, the Assassins, an all-star R&B, funk band from the DC area, and recorded three albums with them. Then, in 1992, Thackery put together his three piece band called the Drivers to highlight his explosive guitar and hit the blues highway.“When you're out on your own, you'd better rise to the occasion. So I found myself back in the 300 night niche. What made that satisfying is that it was my ship and I was the captain of it. We were doing material that I was writing. We were doing arrangements that I came up with." During the following years he has recorded eight discs for Blind Pig Recods in Chicago. His first record, ’Empty Arms Motel’, was released in 1992. 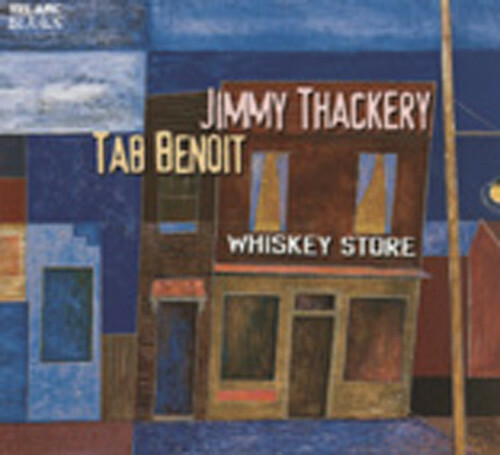 After leaving Blind Pig, Jimmy Thackery released two album on Telarc plus two collaborations with Tab Benoit and a critically acclaimed reunion with his old friend David Raitt on Patrick Ford’s Blue Rock’It label. Thackery continues to record and tour frequently. Customer evaluation for "Whiskey Store"